24 May 2013. The new Mayor of Ellesmere Port is Councillor Bob Crompton. Councillor Crompton is married, has four children and four grandchildren and has lived in Ellesmere Port since 1993. Prior to settling in Ellesmere Port he served in the Royal Air Force for almost thirty years during which time he served in most areas of Great Britain and in various locations from Gibraltar to Hong Kong. After leaving the RAF he became a Councillor for Ellesmere Port and Neston Borough Council. For Cheshire West and Chester Council he is a member for Whitby. During the Council’s ‘shadow’ year he became the Chairman of Culture and Recreation and recently has been Assistant Executive Member for Culture and Recreation. He is also Chairman of the Board of Directors of Brio Leisure, the community interest company set up to run the Borough’s leisure facilities. Last year Councillor Crompton was the Sheriff of Chester. Councillor Crompton was associated with the Scout Association for many years and was leader in different locations around the UK and in Hong Kong. 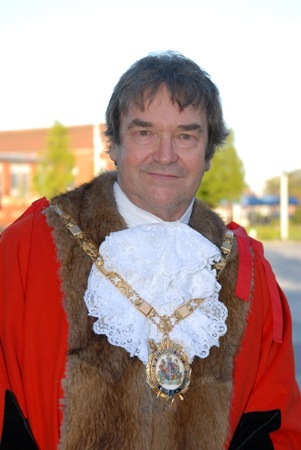 Councillor Crompton says: “I am looking forward to being Mayor of Ellesmere Port and have a definite view of what I hope to achieve during my year in office. “I will aim to meet as many people as I can, support as many different organisations which work selflessly for the good of Ellesmere Port, and support the community initiatives of the Our Place team. 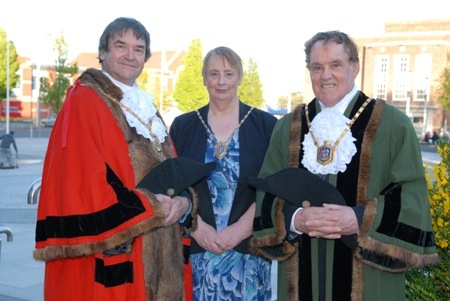 The new Deputy Mayor of Ellesmere Port is Councillor Brian Jones who has a great deal of experience in the role, having been twice Mayor of the former Ellesmere Port and Neston Council. A member for Whitby, he was born in Liverpool and served with the British Army. On his return he worked for Vauxhall Motors and then H H Robertsons for 28 years. Councillor Jones is now a bank nurse for the NHS and covers five hospitals. He is married to Joan and has two grown-up sons and three grandsons.